Welcome to today's stop on the Old-Fashioned Christmas book tour! I'm happy to be sharing this heartwarming book-slash-cookbook with you today, as it's a perfect representation of the holiday spirit. I'm the first to admit that my holiday spirit has dwindled a bit with age. I blame it on consumerism which leads to stress...if you let it. I try not to let it, but it took a toll on me for a while. I think now that my kids are getting a bit older, it's gotten easier, slowly returning that spark to my attitude once the day after Thanksgiving arrives. I adore lights twinkling against the snow and through warm, cozy windows. I love holiday baking to a soundtrack of Christmas tunes. I'm a sucker for Christmas movies of any sort. Plus, is there anything better than having the entire extended family trapped in the house with a crackling fire and a buffet of food on Christmas eve? Okay, that's a loaded question - but you get my point. I also love to see the spirit of giving at the forefront of everybody's thoughts. One of our family traditions is an ornament exchange, White Elephant-style. We all gather at my grandparents house on Christmas eve. Each person brings an ornament—it can be anything from one that winds up sought-after or one that's a gag and nobody wants. I'll admit, it gets heated. Every year. But it's a lot of laughs and something that everybody looks forward to. I've been trying to incorporate an ugly sweater theme into our celebrations, but not everybody wants to play along with that one yet. An Old-Fashioned Christmas is filled with tales of author Ellen Stimson's Christmas stories and traditions, as well as food. So not only will you find inspiration for your holiday meals and cookie tins, you'll also find yourself laughing, nodding, or even crying along. A great book for cooks, bakers, and Christmas lovers alike. I have so many slips of paper poking out of this book marking recipes that I really want to make, but the one I'm sharing with you today may be the simplest of them all. For starters, it's a cake mix cookie. I've mentioned before that I grew up making cake mix cookies in the kitchen with my little brother and sisters, so that element of nostalgia hit me right in the heart. Plus, they have the words "gooey butter" in the title...and I lurve me some gooey butter cake. Oh, and eggnog. Hello! The texture is very reminiscent of gooey butter cake, as is the flavor (since so many are made using a yellow cake mix). I found that the eggnog flavor was more pronounced as they sat, so you may want to make these the day before you serve them. I guess that also makes them a perfect contender for holiday tins. I adapted them ever-so-slightly by using spiced rum instead of rum extract and adding a pinch of salt (because I always do in sweet baked goods). 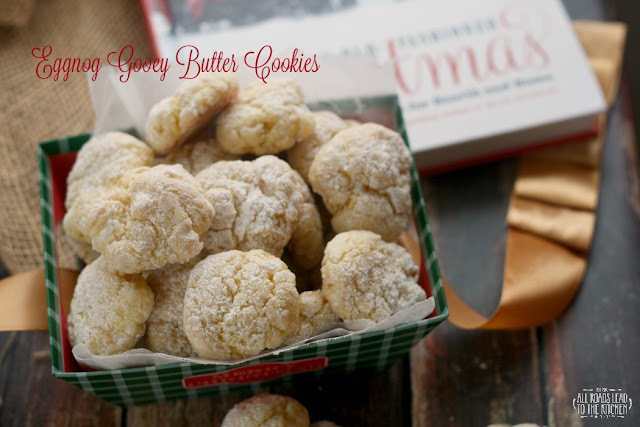 Incredibly simple and super tasty, these eggnog gooey butter cookies use a yellow cake mix as the base. Combine cream cheese and butter in a large bowl and beat with a hand mixer until smooth. Beat in the egg and once that is incorporated, beat in the rum, nutmeg, and salt. Finally, beat in the cake mix until thoroughly incorporated. Cover bowl and refrigerate for 2 hours. Sift the powdered sugar into a smallish bowl. 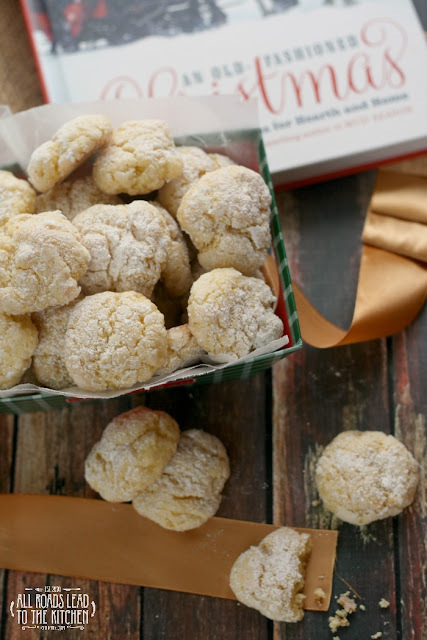 Roll the cookie dough into 1-inch balls, then drop it into the powdered sugar and roll it around until coated (you don't have to shake off the excess). Place on the prepared baking sheets, leaving at least an inch between each one. Slide into the preheated oven and bake for 12 minutes, or until they have turned lightly golden on the bottom (you may need to use a spatula to lift one up). Transfer to a wire rack to cool. Sprinkle with more powdered sugar, if desired. I think these cookies taste best on the second day. The resting time allows the eggnog flavor to develop. 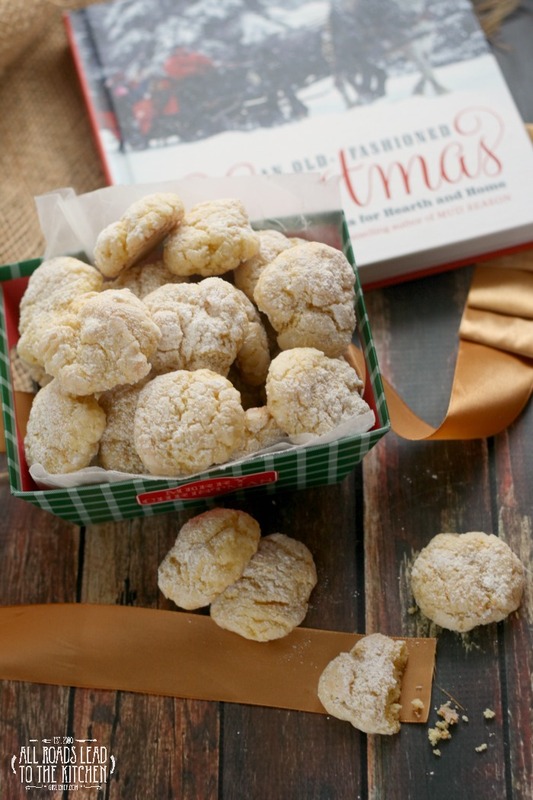 Store completely cooled cookies in an airtight container for up to 3 days. 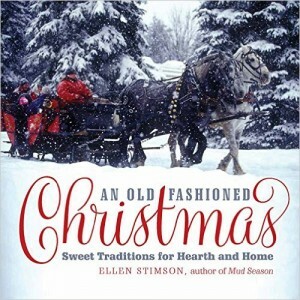 fun features: This book is not only full of delicious recipes for the season, it's also filled with heartwarming stories. I've mentioned it numerous times before, but my favorite cookbooks are the ones that get a little personal...the ones that share background, anecdotes, and a glimpse into the heart of the food. This is one of those books. I'm not ashamed to tell you that I even cried during one of the stories in the book (Batman and the Indian Chief). Not only is this a great book for the kitchen, it makes the perfect holiday season coffee table book, as well. about the author: Ellen Stimson is a bread-and-butter home cook…possibly more butter than bread. Her table is usually overflowing with friends, family, and folks who have come just to listen to her stories. Some of those tales made it into her bestselling memoir, Mud Season. She cooks and writes from a farmhouse in Vermont. Would you like to win a copy of An Old-Fashioned Christmas? Simply leave a comment on this post telling me about one of your favorite Christmas traditions (food or otherwise) and then record your entry in the rafflecopter widget below to be entered for your chance to win a copy of your own. Additional entries are available once the mandatory entry is complete. This giveaway is open to residents of the US and Canada only. Submissions will be accepted through 11:59 pm ET on Tuesday, December 8, 2015. One winner will be chosen via random draw and notified via email within 48 hours of the close of this contest, and given 24 hours in which to respond. If no response is received within that time frame, a new winner will be chosen. All entries will be verified (if the mandatory comment is not received, yet the box is checked, all entries by that person will be voided).